The cast in San Diego Opera’s FLORENCIA EN EL AMAZONAS. March, 2018. Photo by J. Katarzyna Woronowicz Johnson. Because of a painful injury to my right leg, I am unable to attend this San Diego Opera event. I can, however, share some observations about Daniel Catán’s opera based on a previous encounter with it, November 24, 2014, in Los Angeles. It was a co-production by Los Angeles Opera with Houston Grand Opera, Seattle Opera, Opera de Colombia and the Opera de Bellas Artes & Festival Internacional Cervantino. I also saw the opera when it was first presented by LAO in 1997. The pictures here are of San Diego Opera’s current presentation of Florenica which has been receiving good notices. In all the hype and in most of the reviews I have read of Daniel Catán’s Florencia en el Amazonas, the score is “lush” and it “sounds like Puccini.” The lushness is inarguable. Catán’s music is gorgeously scored and washes over the listener with insistent waves of warm, romantic seductiveness. Thematic threads tie everything together and the vocal lines stream lyrically along; yet nothing sung in the opera ever rises to the level of the memorable “big tunes” one cherishes in the operas of Puccini, a uniquely gifted and inspired composer who could also sound very progressive (for his time) as in certain passages from Turandot. Puccini also had a keen sense of drama. 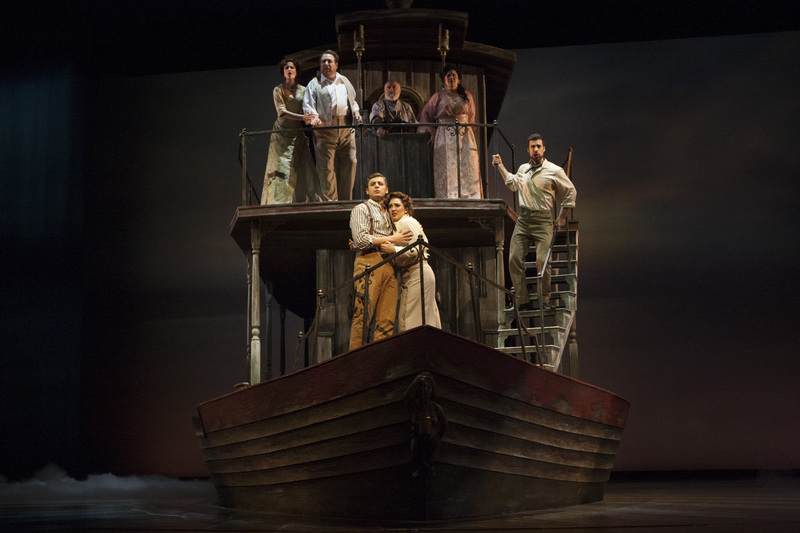 Catán’s Amazonas opera is almost devoid of dramatic urgency, even when stormy weather besets the river steamer sailing downstream from Leticia (Columbia) to Manaus, the capital city of Amazonas in northern Brazil. In fact, with a misty, magical and somewhat loopy story for its text, the whole opera seems to be about setting a mood rather than unfolding a clear narrative. 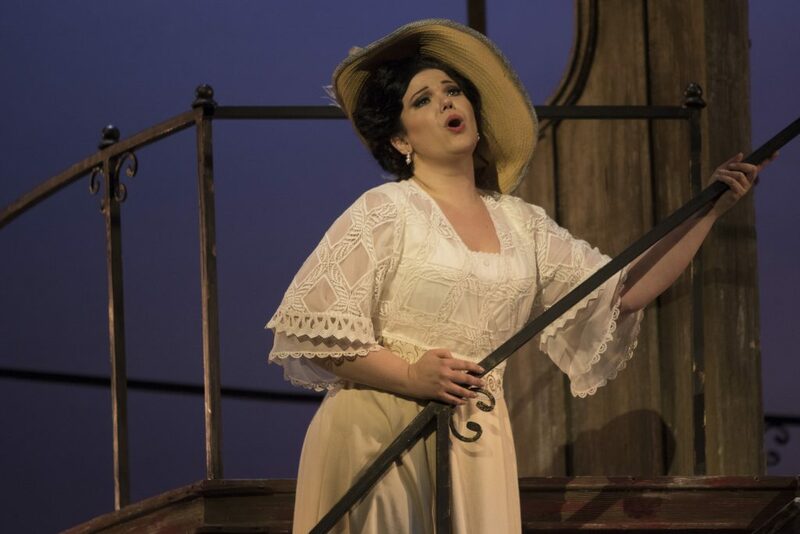 Soprano Elaine Alvarez is Florencia Grimaldi in San Diego Opera’s FLORENCIA EN EL AMAZONAS. March, 2018. Photo by J. Katarzyna Woronowicz Johnson. 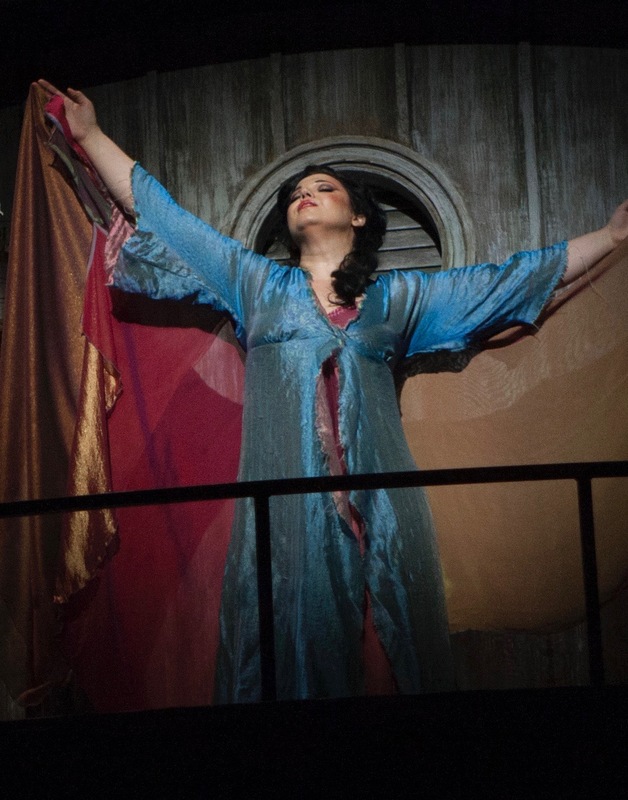 Florencia Grimaldi, a legendary opera diva, boards the good ship El Dorado, and is steaming towards Manaus, city of her homeland and the site of a famous opera house. Once there she hopes to lure back a former lover, Cristóbal, through the irresistible beauty of her song. But he seems to have vanished into the impenetrable tropical verdure in the pursuit of butterflies. Incredibly, despite Florencia’s legendary status, she goes totally unrecognized by her fellow passengers, one of whom is writing a book about her. Imagine, if you will, someone writing a book about Maria Callas or Renata Tebaldi and not recognizing her during an intimate cruise with a handful of passengers. Ah, well! — This is magic realism, although the theater of the absurd springs more readily to mind. (Also a very respectable genre.) Perhaps San Diego’s stage director, Candace Evans, renders this situation more plausibly. Grimaldi’s clueless biographer is Rosalba, a journalist who has already spent two years taking notes. She becomes involved with the steamboat captain’s nephew, Arcadio, who leaps into the river to save her notebook when — oops! — it falls into the roiling waters. The lovers spend their free time onboard playing cards with a quarrelsome couple, Paula and Álvaro, who admire Grimaldi, but also fail to spot her on ship. A storm forces the boat aboard a sandbar and Álvaro goes over the side after attempting to save the day. 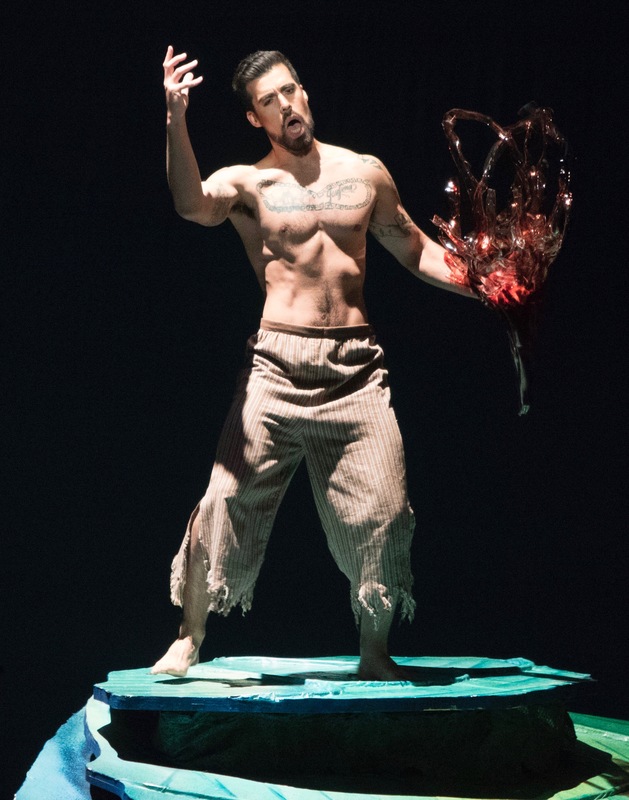 Baritone Luis Alejandro Orozco is Riolobo in San Diego Opera’s FLORENCIA EN EL AMAZONAS. March, 2018. Photo by J. Katarzyna Woronowicz Johnson. The tempest is quelled by the river spirit, Ríolobo, who accomplishes this with help from other sprites. In the LA production, originally directed by Francesca Zambello and recreated in LA by E. Loren Meeker, Ríolobo made a spectacular descent from the sky on golden wings. In LA Ríolobo was a magical master of ceremonies, a narrator, as well as a supernatural coordinator of the story’s events. I regret very much missing it in San Diego. 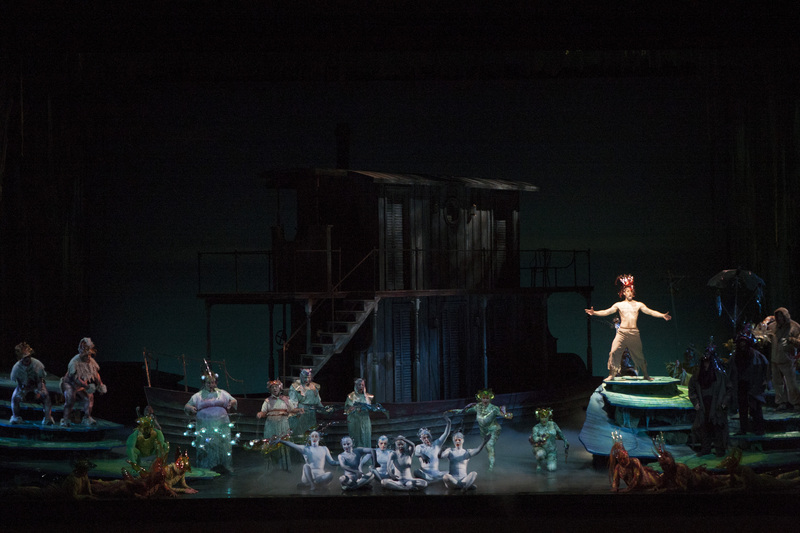 The San Diego Opera has played an important role in bringing Catán’s works to public attention. Three performances remain as of this writing, March 20. Baritone Luis Alejandro Orozco as Riolobo is joined by the San Diego Opera Chorus playing various animals of the Amazon in San Diego Opera’s FLORENCIA EN EL AMAZONAS. March, 2018. Photo by J. Katarzyna Woronowicz Johnson.